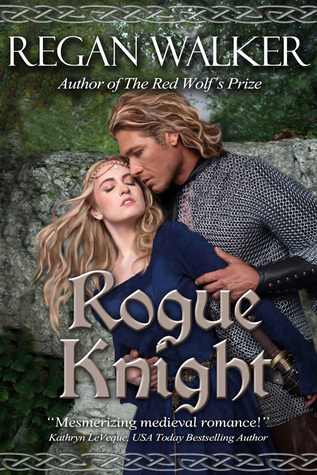 Rogue Knight is book 2 in Regan Walker’s Medieval Warriors series. In it the author expertly brings the enemies to lovers theme vividly to life in a passionate, blood stirring and romantic read set during the aftermath of the Norman conquest. The novel is set at the time when William the Conqueror was busy putting down insurrection after insurrection in the country, the north of England being particularly troublesome. Regan Walker’s research into this time period is extremely thorough and I loved how she weaves real life events and characters into the plot which explores the tensions between love, honour and duty. Both the hero and the heroine are characters whom I quickly fell in love with. 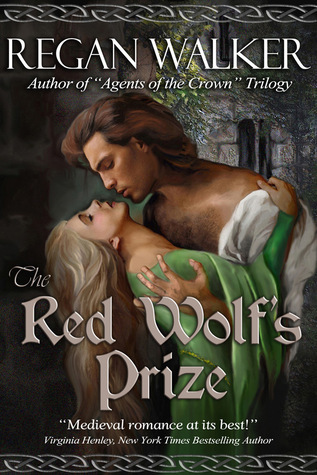 The hero of the tale is Sir Geoffroi de Tournai, who we met in the first book in the series, The Red Wolf’s Prize (click on the book title for my review). Geoff is a noble knight with a strong code of honour, sometimes at odds with the brutal orders of his superiors, in particular King William. The heroine, the young widow Emma of York, has noble Danish blood in her veins and her father is leader of the rebels. Emma is gentle and kind but also one who does not shy away from the responsibilities of her proud lineage in defending those who are weaker than her against the the despised Normans. However, despite the fact that Geoff is her enemy, once they meet, their mutual attraction develops into passion and a deep and abiding love. However, Geoff knows nothing of her links to those who would see him and his compatriots annihilated, and Emma, torn between her loyalty to her father and hatred of the Normans on one side and her growing love for Geoff on the other, keeps this knowledge to herself. How will Geoff react when he learns of Emma’s duplicity and involvement with the rebels and will the couple survive the clash that is brewing between the rebels and William as he seeks revenge. The novel had me on the edge of my seat in terms of the intensity of the plot, and how the political machinations impact on the romance between the couple. It’s a super page-turning read which I recommend to all romance readers but especially those who like to escape into the past. Please note, a copy of this novel was given to me for the purpose of a fair and honest review. “Medieval romance at its best!” –Virginia Henley, NY Times bestselling author. Sir Renaud de Pierrepont, the Norman knight known as the Red Wolf for the beast he slayed with his bare hands, hoped to gain lands with his sword. A year after the Conquest, King William rewards his favored knight with Talisand, the lands of an English thegn slain at Hastings, and orders him to wed the heiress that goes with them, Lady Serena. A fantastic read, full of passion, deceit and adventure! 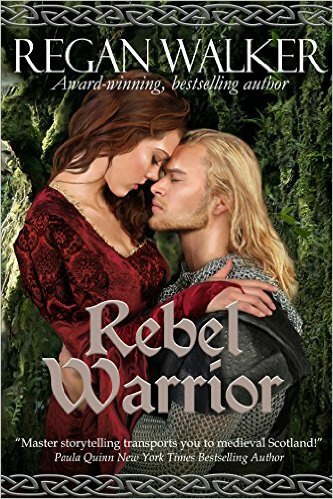 Regan Walker has once again excelled herself with yet another memorable historical romance, this time set in the medieval period. Following his invasion of England William stamps his authority on his new vassals by confiscating lands from English thegns, gifting them to his loyal knights and constructing castles to intimidate and control. Sir Renaud de Peirrepont is gifted the demesne of Talisand and its lady Serena as his bride. I loved this knight, known as the Red Wolf. He has a fearsome reputation on the battlefield but a strong desire for peace and to put down roots in this new land. However, Serena despises the Normans who are busy subjugating her people. Indeed, her own father fell at Hastings and her brother has fled. She is a brave and resourceful woman and I loved how she disguises herself as a servant in an attempt to escape her fate, and even when she is captured and returns to Talisand manages to keep her real identity a secret. Renaud is drawn to her and there are many scenes where he tries to woo her to his bed, a privilege that others would jump at, but she denies him. Such scenes are filled with sexual tension as Serena is equally attracted to Renaud. In fact the more she finds out about this man the more she grows to respect him and it becomes harder to resist. Renaud is furious that his bride has escaped him and is also one frustrated man, his own personal code preventing him from taking his servant by force. She enchants, challenges and perplexes him at the same time. With a castle to build, William requesting his services in battle, a missing bride and a woman who will not submit to his charms, Renaud has his work cut out and I did sympathise with him. Yet how will he react once he discovers Serena’s ruse? Will she submit her body and heart to him or will she once again deceive him and seek to escape? How will she react when he takes up arms against her people? There are also other players with their own agenda and the couple have a mountain to climb before their HEA can be reached. This truly is a ripping, page-turning yarn with a hero and heroine who are just perfect together. There is also a superb cast of secondary characters, Renaud’s fellow knights, Cassandra, Serena’s handmaiden, Maugris, Renaud’s wise counsellor and Rhodri the Welsh bard to name a few. Real life historical figures such as William and English earls also play a part and I am looking forward to the other novels planned in the series. A must read for fans of historical romance, especially those who love medieval romances. An advanced reader copy of this novel was given to me for the purpose of a fair and honest review. I have been planning to read an Amber Dane novel for some time now and sincerely wish that I had not waited quite so long! I adore historical romances, especially those set in the medieval period and I am pleased to say that I have now found another great author to fulfil my fantasies of alpha knights in shining (or even tarnished) armour and sensual tales of how they find their heart’s desire in the midst of such violent and turbulent times. This book is the first in her Northern Knights series, of which book 2, Conquering the Dark Axe and book 3, The Beast of Renald, have already been published as well as other works. 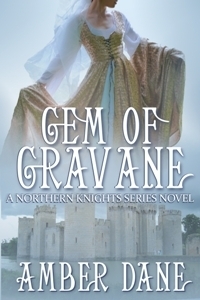 In Gem of Gravane, Knight Aric Claydon is honoured by William the Conqueror, his King and lord, who gifts him, amongst other demesnes, Gravane and the hand in marriage of its lady Danielle, a conquered Saxon. However, this fierce and battle hardened warrior, whose heart pays homage to no woman, delays claiming this particular prize and its lady for a year. Lady Danielle welcomes her new lord and husband to her home with mixed feelings. Held in contempt by the men in her life – first her father and then her odious cousin Thomas, her guardian, she lacks confidence and is highly conscious of a slight affliction she has. She is disappointed when Aric’s initial reaction to her is less than enthusiastic, confirming her fears that he has avoided the union as he has been made aware of her lack of worth. She still harbours a secret hope however, that although Aric is not happy to take her as his bride, his overlordship of Gravane will put many wrongs to right that have been inflicted on her people. Aric is far from immediately enamoured with Danielle, but will do his duty and will endeavour to beget an heir. He knows that something is badly wrong at Gravane and is determined to bring the perpetrators to justice. As soon as the marriage takes place, Aric finds that he is more and more drawn to Danielle, attracted to her soft curves, her kindness to others and even her quirks and he seeks to protect her from any perceived dangers. It also becomes clear that his bride is stronger than he thinks and that she harbours secrets. The more he finds out about her, the more he realises that there is more to her than he first thought. Unused to and uncomfortable with such feelings Aric strives to keep his distance, except in the bedroom, where he is gentle and attentive. The presence of Thomas and his sister Rose and the appearance of characters from Aric’s past do little to alleviate Danielle’s fears and she despairs that Alric will ever return her growing love for him. At the same time danger threatens both Aric and his lady. As we find out if Danielle will succeed in persuading this powerful warrior to take a chance on love, the unfolding tale is laid out like a sumptuous medieval feast. It is brimming with treachery and violence, as well as humour, passion and numerous sensual scenes. I found it a compulsive read! I loved the character of Aric, a proud and powerful warrior. He is protective of Danielle from the off and against his better judgement he cannot keep his emotional distance from her. I also revelled in how Danielle grew in confidence and stature as she was able to assume her rightful role as lady under Aric’s protection, even as she struggled with what she believes is unrequited love. The author’s portrayal of supporting characters were a delight to behold. Aric’s second-in-command Balwain and Danielle’s maid Edie deserve special mention as do the not so savoury characters of Thomas and Rose. We are also introduced to the knight Rourke, the Dark Axe, the hero of the next novel in the series, Conquering the Dark Axe. I recommend Gem of Gravane to readers of historical romance, especially medieval romance, who enjoy a romantic and sensual tale, with engaging characters, which does not shy away from depicting the violence and the treachery that was commonplace at the time.